TOMS RIVER – Five years to the day after Superstorm Sandy struck New Jersey, survivors took refuge from a heavy rainstorm inside St. Andrew UMC in Toms River. Removing coats and shaking out umbrellas, they gathered to remember a different, much more powerful storm, and recognize those who helped them build a future with hope. GNJ commemorated the anniversary with a conference-wide Day of Prayer on Oct. 29. 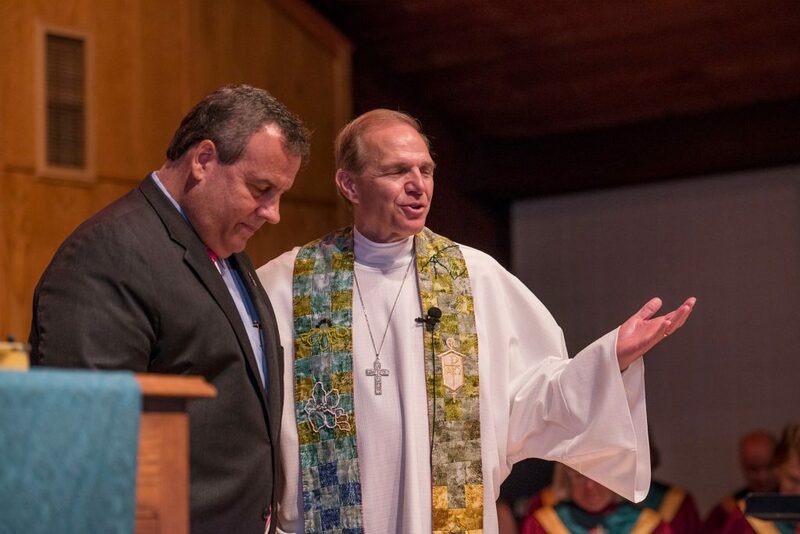 At St. Andrew, Bishop John Schol, New Jersey Governor Chris Christie and his cabinet, and 14 mayors from around the state took part in a worship service to reflect, pray for those still recovering and call leaders to finish the work that’s begun. The service credited the success of recovery efforts to partnerships between nonprofit and faith organizations, donors, local and statewide government, and thousands of volunteers from throughout the country. In October 2012, Sandy left 2. 7 million without power and more than $50 billion in damage. The partnerships celebrated at the service helped return most of the 82,000 homeowners with major damage back home. Within weeks of the storm, GNJ staff started hiring coordinators, case managers, and a construction manager so that by January the newly formed A Future With Hope organization was on its way to providing long-term recovery relief to Sandy-affected homeowners. Today, A Future With Hope is one of the last remaining nonprofit organizations on the ground assisting with long-term recovery efforts. In the past five years, it has helped 461 families with case management support, completed construction on 260 homes, and coordinated some 12,173 volunteers, including United Methodists as well as Lutherans, Episcopalians, Mennonites and many others from 46 states in the U.S. and from Canada. Presently, 15 homes are under construction. A Future With Hope has received support from the Robin Hood Foundation, the American Red Cross, The Hurricane Sandy NJ Relief Fund and the United Methodist Committee on Relief (UMCOR) among others. Bobbie Ridgely, Executive Director of A Future With Hope said people are surprised to learn recovery is still underway five years after the storm. With help from A Future With Hope, Frank and MaryEllen Azack of Toms River, who were featured in a video presented at the church service, received their Certificate of Occupancy on Sept. 21, 2017. For nearly five years, Frank lived in a nearby apartment while devoting full-time to recovery. MaryEllen, who has multiple sclerosis, stayed with her mother in Kearny, about an hour away, because she was unable to navigate the stairs in the apartment. “It’s been a long battle, but we’re finally home,” Frank said. The video featured the couple seated in their bright living room, sharing their recovery story. Without help from energetic volunteer crews and case managers from A Future With Hope, the Azacks said they’d likely be homeless. Ridgely expressed how recovery projects are a testament to the power of United Methodist connectionalism not only in getting work done but in serving others as a witness. Now Board of Trustees of A Future With Hope wants to build on the momentum of A Future With Hope by focusing on community-building endeavors. Hope Centers will provide vital community resources, some of which will include childcare, after-school programs or tutoring for students as A Future With Hope assists in economic development within low-income communities by helping to provide housing, job readiness classes and other social services that strengthen neighborhoods. Additionally, United Methodist churches throughout GNJ are looking to re-purpose older structures that no longer serve the community into places that do exactly that. One project is Christ UMC in Jersey City which will re-purpose its building to provide new worship and community space as well as more than 120 units of affordable and market-rate housing to serve the community and create revenue streams for mission and ministry. At the same time, A Future With Hope remains committed to Sandy recovery. At the conclusion of the service, Christie, too, thanked the thousands of people and organizations who worked to restore storm ravaged communities.